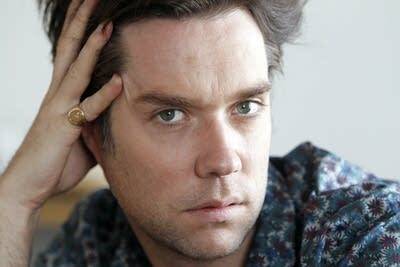 Rufus Wainwright, well-known as a pop vocalist, has just released a recording of his debut opera Prima Donna. I recently spoke with him by phone from New York; he talked about the inspiration for the opera, why he's proud of the new recording, and what he has planned next. It certainly sets a high bar when you're interviewing a composer about an opera that centers on a particularly passionate interview. Yes! Probably it's a good thing we're not seeing each other in public, because it would be too fraught. I'm sorry to begin the interview on a sad note, but it seems it would be remiss not to mention the fact that clearly we're all thinking about Paris this week; it's the city where your opera is set. How have you been processing the news? I was actually in Paris on the horrible night, and it's still setting in. I didn't see anything, personally, that was traumatizing, but I have a lot of friends who did. It's a very, very difficult time, but of course being from New York — even right now, I'm doing this interview from downtown, near Wall Street — it's a part of our lives now, all over the world, so we just have to keep moving forward. What does it mean for you to have this opera released as a recording now, six years after its premiere? It's an incredible feat, and I say that because I know that. Whether it's mounting the piece or composing it, orchestrating it, finding the conductor, finding the singers...every facet of the world of opera is highly faceted. To get it out with such a great performance and with such a wonderful orchestra like the BBC Symphony, and Jayce Ogren conducting and Janis Kelly singing, and then do that on Deutsche Grammophon, which is one of the classic labels of all time, I'm really proud of myself. I can be accused of being a little bit haughty about my own accomplishments over the year, but I'm actually a very humble person, believe it or not, and I do try to tone it down — especially since my mother told me to, several times. With this thing I'm really, really proud. Your family is legendary in folk and rock circles, and music was crucial to your upbringing — but you didn't fall in love with opera until your teens. How did that come about? Opera was slightly around. My mother and my aunts, they loved tenors — but that, in a lot of ways, was very much connected to Pavarotti and Domingo. Those were big stars that pretty much everybody knew about, and that was a tradition that had been around for a while that my mother grew up with. Everybody knew their tenors — it's not like that any more — but that was the extent of it. My mother was a big fan of Jussi Björling, a Swedish tenor from the '50s, and one day she brought home a recording of Verdi's Requiem with Jussi Björling and Leontyne Price, and I listened to that, and by the end of that experience I was totally hooked on opera, and it was the central musical movement of my life. I subsequently brought my mother with me on that voyage. She sadly passed away five years ago from a rare form of cancer called sarcoma, but she and I really lived our kind romantic gay-son/mom theatrics in the opera houses of the world, and it was a wonderful experience. Was that also the beginning of your love affair with Verdi? You dressed as Verdi for the opera's premiere. Yes, I dressed as Verdi for the opera's premiere. My husband Jörn was Puccini, and in fact, before I was in Paris the other day I was in Italy, and I went to visit the home of Verdi in Sant'Agata. I knew it would be a big deal, but I wasn't expecting to be crying as I was pulling into the driveway listening to La Traviata. Verdi still means very, very much to me. Is it just a personal emotional connection? What is it about Verdi's music that makes him so important to you? I don't write music like Verdi's. If anything, I write music more like Puccini or Strauss, but Verdi somehow always filled this gap in my life of a sort of stern but present parent. My dad — God bless him, I adore my dad, and he works very hard for his music, but in order for him to do what he had to do, he had to tour a lot and he wasn't around. I feel like Verdi — probably because he didn't have any kids, sadly because they died when he was very young, his two children and his first wife — but he did become the father of the country, and he had this kind of strange personality that on the one hand was very loving and very emotional, but also sort of cold and disciplined at the same time. I don't know...he was my daddy! To talk about another fascinating opera figure: this opera was inspired by an interview with Maria Callas. What is it, do you think, about Callas that keeps her so fascinating after all these years? Callas also was a big figure in my formative operatic years, learning about that music, and in fact my mother and I listened to a lot of Callas. At one point we were summering in Martha's Vineyard, near Jackie Onassis's house, where we knew she was staying, and we used to drive around her property blaring "Casta Diva" by Callas, a song from the opera Norma, just to try to annoy her. Arguably, with Callas, on one hand she's a great opera singer but she was really more of a cultural icon, and someone who really tore through the boundaries of whether it was opera or whether it was the gossip columns. She was bigger than life, and so it did come a bit from her initially, from these great interviews I saw her do. Immediately, I didn't want it to be an opera about Callas per se, so I shifted it more towards Régine Saint Laurent, who is totally my creation. That actually gets to another of my creations, which is about a comment you made in an interview with the Telegraph, saying that opera has become too intellectual and exclusive, and that melody has become lost. Do you think that making opera more accessible is just about the music, or is it about more than that? Let's just make it about the music, because if the music is great, then we're doing fine. My main argument is that there was a time when opera had several facets. You had Wagner writing at the same time as Offenbach, and Verdi at the same time as Puccini — though Puccini was later, but still, it seemed like there were these different avenues that people could go and enjoy. Now, it's become very monolithic and ruled by this traditional concept of, really, a more academic exercise. I don't think that should be destroyed, necessarily — I'm not an iconoclast — but I do feel there should be options. The truth of the matter is that most people do not really like modern opera, and they're never going to, because it doesn't make sense to them, but a lot of them will like Romantic opera, because it is very passionate and very melodic and they can eventually relate to it — and then they might get into modern opera after that, atonal opera specifically. Who knows? I just want to be part of the process. I think it's an important part of the process in terms of keeping opera relevant and alive. So why not, in other words, write a contemporary opera in the Romantic tradition. Yeah. Which is what I've done, essentially. Now you're working on your next opera, about the Emperor Hadrian. What are you looking forward to exploring in your next work? Everything I do is instinctual, so I'm just going ahead, and I say to the commissioner — it's being commissioned by the Canadian Opera Company in Toronto, which is this fabulous company run by Alexander Neef — I just said, give me a date. Give me some time, but give me a date, actually, that I have to finish it for, and I'll give you an opera. I tend not to think about it too much; I just kind of go down there and start enjoying making music. One thing I did want to mention, and this relates to the last question, is that there have been comments like, "Oh, he can't write a Romantic opera now! Isn't he aware of all the changes that have occurred since 1927?" and so forth. That, to me, is exactly the reason why I should be writing my operas: because anybody who says "You can't do this," should be made to pay. Will the next opera be somewhat in the same musical mold? It's sounding very Italian — which makes sense, because most of it takes place in Rome. Yes, it's going to be melodic, it's going to be Romantic. I don't think it will be as Impressionistic or French-sounding as the last one, but I don't know. If anything, the composer that's most coming in and out of my mind is Nino Rota, actually, who wrote some very beautiful operas and whose music for Satyricon I particularly enjoy. You wrote and orchestrated this entire opera yourself. It must have been a fascinating learning experience, in terms of really getting inside the orchestra. What did you learn about orchestral writing while working on Prima Donna? I'd orchestrated arrangements before for my pop work, and I did go to music school for a short time, and I studied piano for 12 years, so I know the parameters — but I by no means excelled in that environment. Now, thanks to modern technology — i.e. Sibelius programs — and the help of some wonderful assistants who have these incredible educations, I can sit down with someone. I'm not afraid to say this, because I do think it's important to start this relationship where I'm there and we start it and every note, I sing or I play, and they help me figure out — I mean, I get better as I go along, obviously — but I think it's very much akin to when Renaissance painters would have assistants who would help them paint things, or fashion designers who say, I want this to be sewn here, and it's more in that [spirit] than the lone composer alone with a candelabra in a freezing garret, dying and writing their last notes. Now we have the technology to do that, so it's cool. I'm interested that you used the word "important" there. Do you think it's important to open up the process to the public and help people understand how this music is created? Oh, totally. I'm someone who is devoted to the form of opera, and I think there are other popular musicians who are curious about it, and some who know a lot about it as well. On the other hand, there's this incredible wealth of young people coming out of conservatories all over the world who have this insane knowledge of how to write scores and how to orchestrate. I just feel like the two need to meet up somewhere. I feel it's a good template for both pop people to get more sophisticated, and for opera people to get more in touch with what's going on with the kids and the mainstream. I think it's an important link.